It is no secret that everyone here at Dreadful Tales absolutely loves Jeff Strand’s Dweller. If we were the type of people who made up “Best of the Year” lists, I think Dweller would have been unanimously voted into the top spot last year. The story was extremely touching, very funny and downright scary but what always stuck with me was the prologue. That’s right, in a book filled with some of the best writing this (or any) genre has to offer I chose to focus on the prologue. For those of you who have not had the pleasure of reading Dweller, the prologue is told through the eyes of a monster that is chasing some humans through the woods. Instead of the typical scares that would accompany such a scene, Strand pulls the rug out from under the reader by simply stating that the monster is after his food. This is how the monster lives and there is nothing exceptionally strange or horrific about this scene at all. It was at that moment that I became a Jeff Strand fan-boy and since then I have always wondered what an entire story written from such a bizarre perspective would look like. Well, my wait is finally over because Jeff Strand has fulfilled my wish by writing Specimen 313. Specimen 313 is a short story that is written from the perspective of a genetically altered plant, known as Max, who has been created by a crazed scientist. This scientist is continually rotating the plants in his greenhouse as he creates more and more advanced plants. Max spends his days living in fear that he will one day be transplanted from the friendly confines of the greenhouse and discarded to make room for a new, more advanced creation. One day, the plant next to Max is replaced by Specimen 313, or Jenny, and love blossoms in Max’s heart. From this point Strand takes the reader through a series of bloody and touching scenes that lead to a wonderfully charming climax. All of which, takes place in just a few pages. The story is classic Strand as it straddles the line between humor and horror with a brilliance that is unmatched. Specimen 313 also has ample amounts of heart which seems to be a staple of Strand’s more recent efforts. I mean here we have a story about a mad scientist who is feeding homeless men to genetically altered carnivorous plants, but at it’s core, Specimen 313 is a love story between two lost souls and that is what is so special about, not only this story, but Strand as an author. The man has a knack for writing captivating tales of absurdity that still manage to tug at those heartstrings. The story is incredibly short but it certainly is a must-read. It is a great introduction for genre fans who have not had the pleasure of reading Strand and , of course, long-time Strand fans will relish in his refreshing and unique style that we have all grown to love. Specimen 313 is currently available as a free download for a limited time so do yourself a favor and check it out. The story can also be found in The Monster’s Corner which is due out this fall. 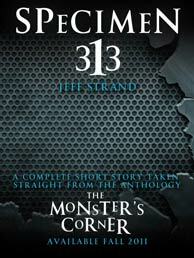 This entry was posted in Reviews, Short Stories and tagged Jeff Strand, Specimen 313 by Pat Dreadful. Bookmark the permalink.